Word has it that they are dating but some sources are saying they are so not. And here’s they said in a statement they just released. Our investigation has revealed that the story making the rounds on some blogs that respected man of God, Rev. 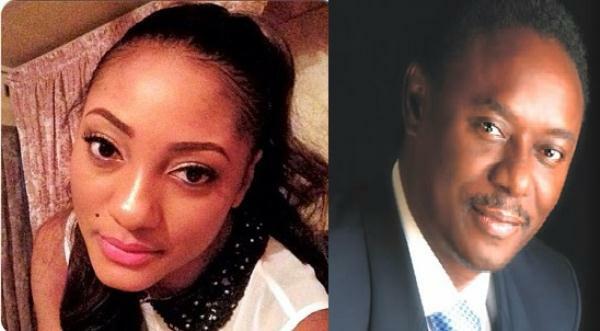 Chris Okotie has found a new love is totally false. According to our findings, the Reverend has no love relationship with Delphine the lady in question , who only attended the recent event of the Copyright Society of Nigeria, COSON, hosted by Rev Okotie’s Household of God Church, as one of the invitees. Some guys, who are trying to extort money from the young lady, embarked on this campaign of calumny, on the erroneous impression that because she was spotted in the Household of God Church on one or two occasions, she is probably close to the flamboyant pastor, whereas Delphine only attends events there on the invitation of her friends.